Bebe Moore Campbell died this week at her home in Los Angeles of complications of brain cancer. She was 56 years old. I featured Bebe’s book, Your Blues Ain’t Like Mine (1992), in a chapter of my final dissertation on 20th Century Black American women writers. According to an obituary in the Sacramento Bee, Campbell said she "wanted to put a face on racism." She called racism "a family problem." She certainly got personal in her narrative, sending the worst perpetrators straight to hell. I will always admire her for wielding her pen as an impaler and corrector. Those deserving got their just rewards, too. Her book was a very satisfying read because it boldly revised the script of the centuries-old master narrative/history where whites, especially men, always got every thing & everybody. Imagine the slaves being free, taking over the plantations, owning them &amp;amp;amp;amp; running them well & thriving, having the power & skills to direct their own lives, to fulfill their own dreams. All of that positive social and economic transformation was there metaphorically in the novel against the horrible backdrop of a young black boy's brutal, senseless killing by hateful people (like Emmett Till's murder in 1955 in Mississippi). I recall that my dissertation adviser didn't want Blues featured in my project. (Campbell was an unknown in our academic circle because she had never been on a syllabus that I knew of & her work had never been discussed in a seminar, to my knowledge). But it was my dss. & I prevailed in using Campbell's debut novel as the bottom slice of the bread in the sandwich I was making of black women's struggle to be writers, from slavery to the present & all my own grievances & triumphs as a black woman scholar/writer struggling to survive whole in higher academia & come out on the other side with terminal degree in hand. (bell hooks can tell you a tear-jerking story about this soul-numbing experience). I loved Campbell's book "Singing in the Comeback Choir" (1998) for its celebration of female strength when faced with adversity from within--betrayal by her lover/husband. It was dime paperback lifted & dusted off, taken to the showers & dressed in Macy's finest. Best of all, it was black, intelligent, uplifting & relative to my own experience as a woman. I love the way Campbell referred to the mother, aunt & grandmother who raised her in philadelphia as "the Bosoms." No stronger, more nurturing, comforting &loving support exists than maternal bosoms. 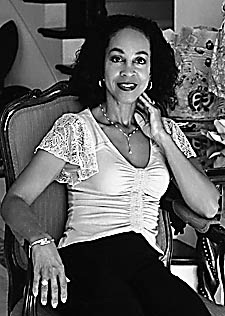 I never met Bebe Moore Campbell, I never heard her speak, but I felt a special writerly soul connection to her & I am saddened to be reading her obituary instead of a new insightful book by her. But isn't legacy wonderful? She is alive in the eternal fruits of her labor-- her writing-- & lives as long as we remember & honor her for her unique, artistic contribution to our lives and culture. This lovely, soulful woman has left us a spiritual gift that keeps giving, stays beautiful & loves beyond the grave. ...and you shall do the same.